With the country blanketed in cold snap after cold snap, we turn to Instagram for inspiration that will warm you up like a bold cabernet and well-stocked fire. 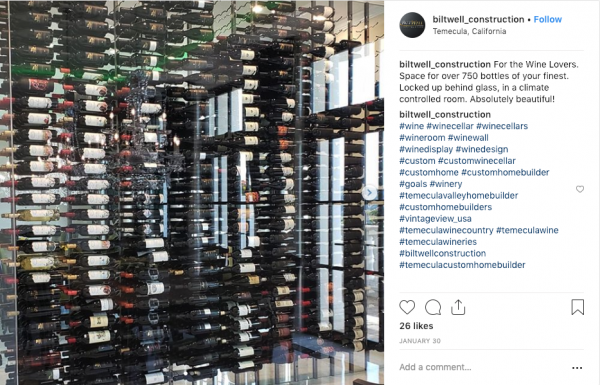 Biltwell Construction is in the business of luxury and a lucky homeowner in the SoCal wine region of Temecula now has a showcase of 750 bottles. This cellar can be locked, and is climate-controlled to keep the good air in and the sticky fingers out. This is a beautiful way to create a centerpiece in your home. Almost every month, we post a wine cellar under the stairs because we continue to be amazing at the infinite possibilities. 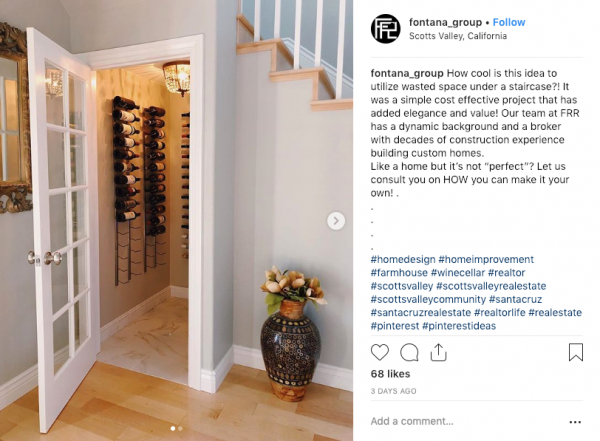 Fontana Group shows off this simple, cost-effective project that adds elegance and value to the home. Who ever said basements were better hasn’t put a wine cellar on the main floor. 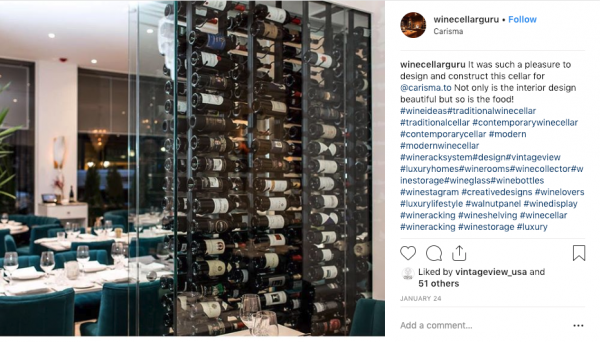 Carisma, a delicious Toronto Italian restaurant, worked with Papro Wine Cellars on a design refresh that put wine at the forefront of the dining room. A contemporary addition to the space, designers created a floating wine wall enclosed in glass (also known a a great way to engage guests with the wine list). configuration and Floor-to-Ceiling Frames in satin black finish. We love this minimalistic and sleek design by JJP construction. The contemporary metal racking against the white brick complements the chic design of the home. An easy glass door allows the homeowner quick access to their wines and leads guests into the dining room for good food and great laughs. Wine bars are some of our favorites places to eat, drink and gather. 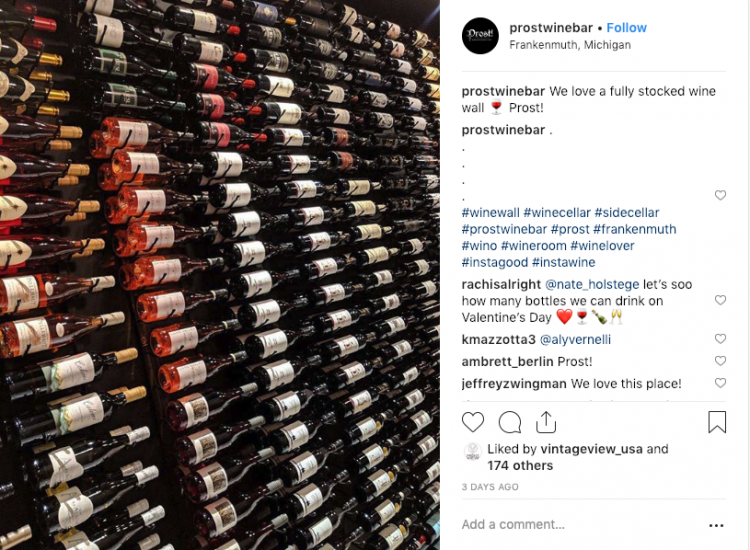 Prost Wine Bar in Frankenmuth, Michigan, is no exception. A wine wall like this one invites guests into the space to explore a diverse wine selection and ultimately feel like they’re at home. 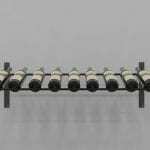 Wine wall features Wall Series wine racks in double-deep bottle configuration in satin black finish. Is a wine cellar with no wine still a wine cellar? Yes. 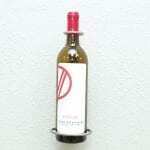 It just means it’s time to join a new wine club to get it stocked. 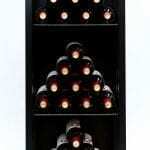 This stunning and elegant wine cellar takes our breath away even without the bottles. From the lush curtains, to the chandelier and steel framed wine cellar doors, we feel that this may actually be what wine heaven looks like. 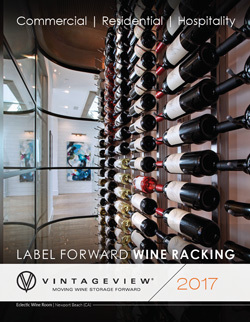 Design by Vintage Wine Cellars, an Elite VintageView partner, with assists from Maiden Steel, Noe Design Co., and Wine Guardian. 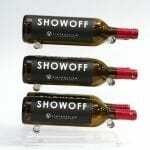 Wine display features Wall Series wine racks in triple-deep bottle configuration and magnum racking in brushed nickel.